Got Data? 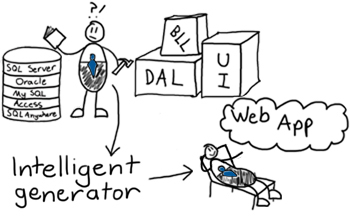 Generate modern line-of-business web apps in minutes! 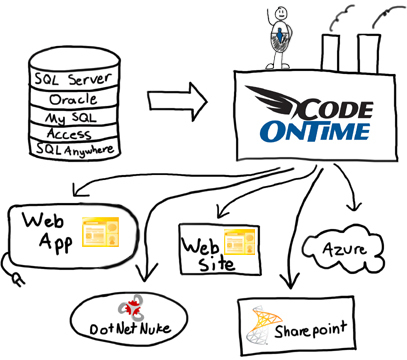 Code On Time web application generator will create advanced web apps straight from your database. These web applications are rich with features, such as adaptive filtering, search bars, reporting, charts, and data sheet view. All you need is a database, and you can impress your customers and peers in a few short minutes. Your enterprise-class web app will be ready for immediate deployment to your own server, shared, or dedicated hosting provider. You can even deploy directly to the cloud. Take a quick look at the Azure Factory tutorial that will show the web application generator in action. We will show you how to generate and deploy a web application to Windows Azure Cloud. Instantly produce impressive business applications hosted natively in Microsoft SharePoint intranet portal. You can also easily build line-of-business web modules for the popular content management system DotNetNuke. Why Use Code On Time? Building web applications is a difficult ordeal - you will need to build everything from scratch, including a business logic layer, data access layer, and more. And this is just for a basic application. Add a sophisticated user interface to that, and advanced features such as reporting and charting. Once you get past all the bugs and integration issues that may arise, months may have passed. And if project requirements change, you might have to change everything. Let Code On Time web application generator take the burden - it will generate a highly functional web application that will suit most, if not all, of your needs. Take the baseline application and deploy it immediately, or add the things you want to perfect your application even further. Use the Project Designer or Designer Spreadsheet to quickly add modifications. For further changes, use Visual Studio. How does Code On Time Web Application Generator work? Code On Time web app generator will read your database, apply intelligent generation logic to the data and relationships, and generate a sophisticated web app based on the set up of your database. All you need to do is provide a connection string and press Generate. Within a few minutes, you will have a feature-loaded application ready for deployment. If you want to modify the baseline application, you can change settings in the Generator, use the Project Designer or Designer Spreadsheet, and even use Notepad or Microsoft Visual Studio to change the source code directly. There are no blackbox DLLs. Web app source code is compact and generated with extensibility in mind. Code On Time Generator is a multi-talented web application generator. Depending on your needs, you can generate anything from a nonprofit web site application in the cloud, to a line-of-business application integrated in a corporate content management system.